Hanoi’s Old Quarter, sometimes called 36 Streets, has a history as old as the city itself. When Ly Thai, the Vietnamese emperor moved the capital of Vietnam to Hanoi in the 11th century, artisans and craftsmen relocated to the area around the royal palace to open businesses. 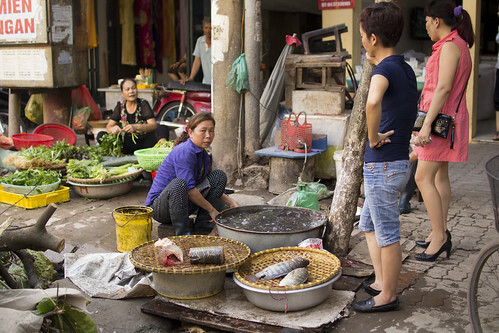 As craftsmen formed guilds devoted to their specialties, the 36 streets became an important trading center along the Red River delta, known for its specialized products and services found on each street. Despite the hardships due to French colonization the 19th and 20th century, commerce continued to thrive in the old quarter, as locals and foreigners forged business partnerships and trade deals. Though the old quarter has evolved over time, its old world charm endures. The streets of the old quarter are still lined with tube houses–long, narrow dwellings that were constructed during a time when taxes were based on how much of a building had access to the street. 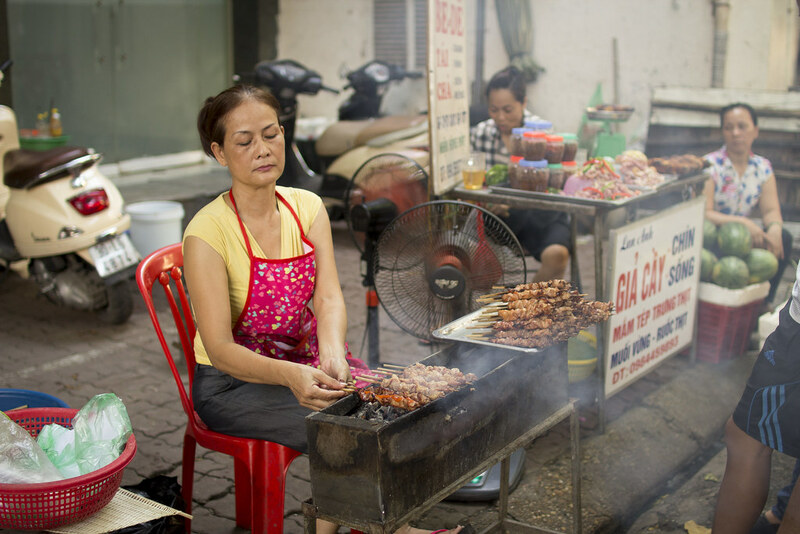 It is from these homes that artisans, restaurateurs, and merchants continue to run their businesses and go about their lives. Women haggle over fresh fish in the market. 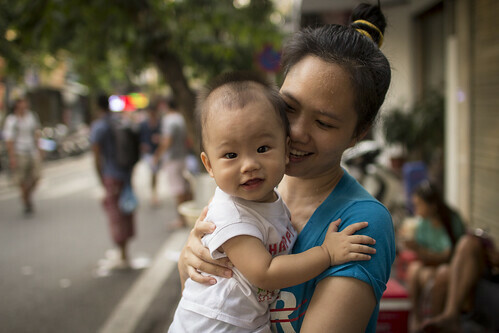 A young mother swells with pride as her young son flashes me a smile. 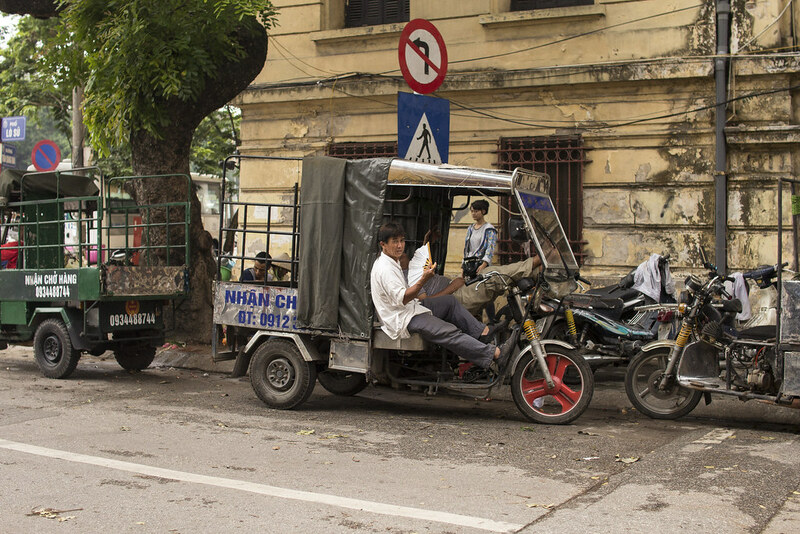 The driver of a three-wheeled motorcycle cart waits for business. 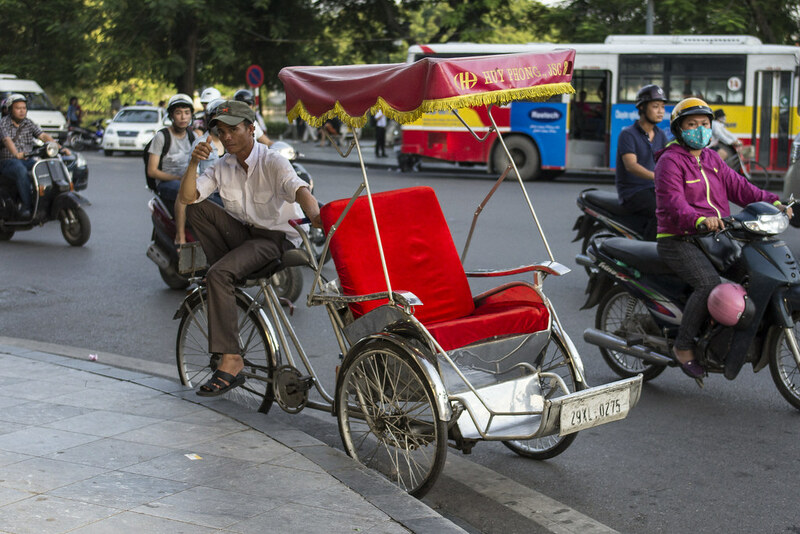 These vehicles can be seen in other parts of Vietnam, but no where are they more popular than in Hanoi. Because most families only own mopeds, these vehicles stay busy hauling cargo around Hanoi for families and businesses. 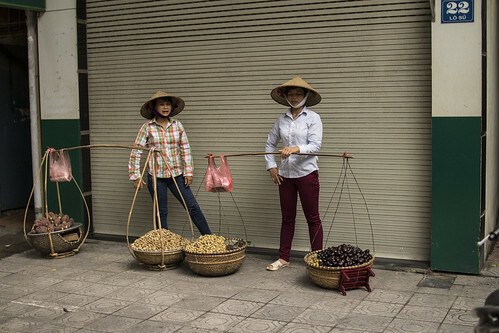 Vietnamese girls take a break from carrying their heavy loads. 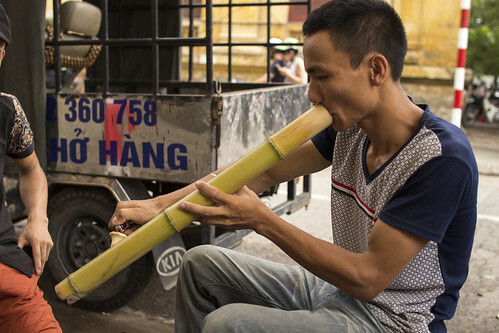 A man takes a hit of tobacco from a bamboo water pipe. The user ignites the tobacco while inhaling. This creates a loud whistling sound created by the suction within the pipe, as a powerful flood of nicotine is delivered to the bloodstream . 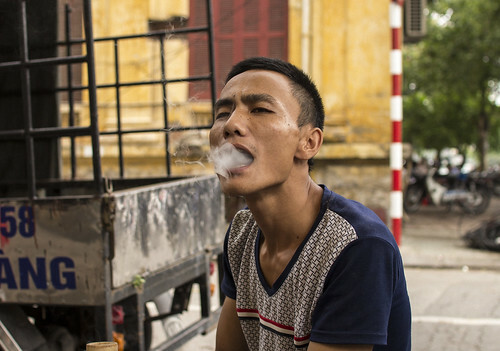 The user then exhales back through the pipe, which pops the used tobacco out of the pipe. The variety of tobacco used in Vietnam is incredibly potent, containing up to nine times more nicotine than is found in more common types of tobacco. Because of the potency of the tobacco and the large volume of smoke, the hit can cause dizziness, nausea, and vomiting. A woman grills kebabs over hot coals as the mouth-watering aroma of spices fills the air. 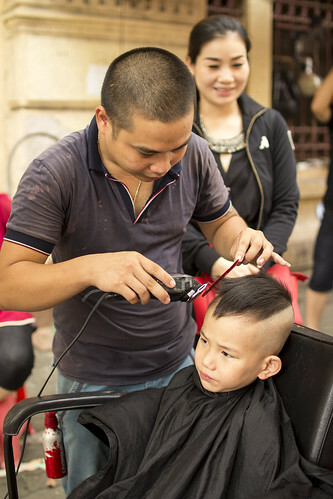 A young boy does his best to remain still as a street barber finishes the final touches of his haircut. A cyclo driver calls out to passersby. In most areas of Hanoi, cyclos are no longer allowed, but they still rule the streets in the old quarter. 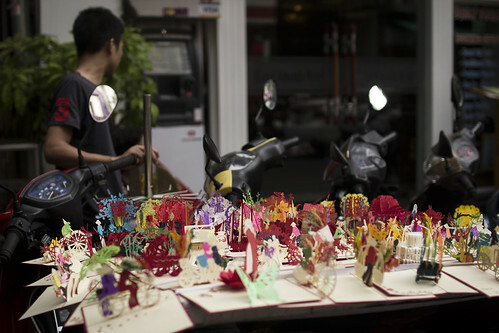 Pop up greeting cards displayed a top a row of mopeds. 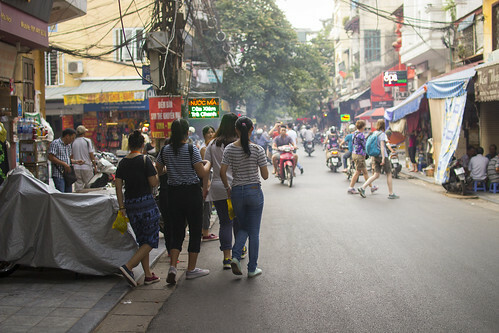 Teenage girls enjoy a carefree stroll through the busy streets of the old quarter. 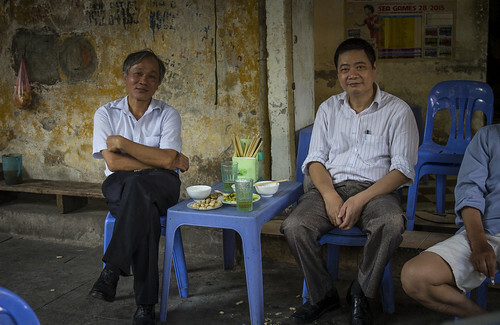 Businessmen reward a hard day of work with street food and iced green tea.